This lease addendum is designed to be completed by the industrial tenant when the lease is signed and every year thereafter. This process monitors activities that might give rise to environmental problems for the landlord. THIS LEASE ADDENDUM (the "Addendum"), is made and entered into this _____ day of __________, by and between COMMERCIAL PROPERTY LANDLORD, INC.,hereinafter referred to as "Landlord," and ACCEPTABLE TENANT, INC., hereinafter referred to as "Tenant," and modifies that certain lease (the "Lease") of even date herewith. 1. Prior to executing the Lease, Tenant has completed, executed and delivered to Landlord a Hazardous Materials Disclosure Certificate ("INITIAL DISCLOSURE CERTIFICATE"), a fully completed copy of which is attached hereto as EXHIBIT A and incorporated herein by this reference. Tenant covenants, represents and warrants to Landlord that the information on the Initial Disclosure Certificate is, to the best of Tenant's knowledge, true and correct and accurately describes the Hazardous Materials which will be manufactured, treated, used or stored on or about the Premises by Tenant or Tenant's Agents. 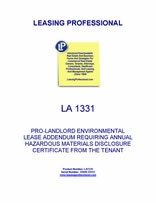 Tenant shall, on an annual basis, complete, execute and deliver to Landlord an updated Disclosure Certificate (each, an "UPDATED DISCLOSURE CERTIFICATE") describing Tenant's then current and proposed future uses of Hazardous Materials on or about the Premises, which Updated Disclosure Certificates shall be in the same format as that which is set forth in Exhibit A or in such updated format as Landlord may reasonably require from time to time. Tenant shall deliver to Landlord copies of any and all filings (a "FILING") made after the Commencement Date with any state, local or federal governmental agencies relating to Hazardous Materials used or to be used on or about the Premises and Tenant shall promptly upon Landlord's request make appropriate representatives of Tenant available to discuss with Landlord any such Filing. Tenant shall make no use of Hazardous Materials on or about the Premises except as described in the Initial Disclosure Certificate or an Updated Disclosure Certificate, as required hereunder.